The beds were super comfy! And the location was quite good! Was an easy walk to Victoria Station and Buckingham Palace. Property is very close to Victoria Coach/train station. Safe neighborhood to walk late at night. Staff was friendly. Very good price/value ratio. Location is good for London (30min walk to the centre, 8min to the subway). Staff is kind and breakfast is sufficient (continental). Reception staff were very helpful, good location to walk to local attraction such as the West End or Buckingham Palace etc, plus the WiFi was fast. The staff was very nice, breakfast was great and the location to train/bus transit was very accessible. No hot breakfast besides toast but ample. The location was very good. Tiny room in the attic up 4 flights but was all I needed for a night as was on my own then. Could see the London eye. Hanover Hotel Victoria This rating is a reflection of how the property compares to the industry standard when it comes to price, facilities and services available. It's based on a self-evaluation by the property. Use this rating to help choose your stay! 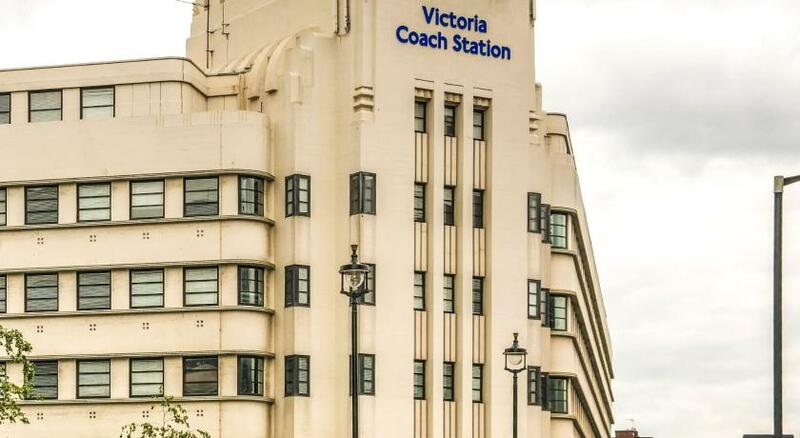 This budget hotel is 2,950 feet from London Victoria Station and the Gatwick Express airport train service. It has free Wi-Fi, a 24-hour reception desk, luggage storage and affordable rooms with attached bathroom. A continental breakfast is available each morning and includes cereal, toast, tea/coffee and orange juice. The Hanover Hotel Victoria is less than a mile (1 mi) from Buckingham Palace, the Tate Britain art gallery and the Houses of Parliament. There are shops, pubs and restaurants nearby. When would you like to stay at Hanover Hotel Victoria? House Rules Hanover Hotel Victoria takes special requests – add in the next step! Debit card Hanover Hotel Victoria accepts these cards and reserves the right to temporarily hold an amount prior to arrival. Hanover Hotel Victoria accepts these cards and reserves the right to temporarily hold an amount prior to arrival. There is no elevator at this hotel. The hotel will assist with guests' luggage wherever possible. Good location and staff helpful. The staff and the location was spot on. Heater wasn’t work all night. The shower tap was broken, hear the water drop all night. Room is not clean and cold. Bad service. Poor facilities. Dirty place. Nothing at all. Do never recommend it. Awful place to stay. It's a building site and doesn't match the website at all. Breakfast is a few bits of pastries and fruit with no plates and nowhere to even eat it or drink a coffee. The carpets are filthy and very badly stained. At one stage we didn't have electricity in our plugs or warm warm. The shower didn't drain properly so we had to stop mid-shower to let the water out. We couldn't open the windows as the half built wall and building work had everything covered in thick dust/dirt. A hostel would be better. Do not stay here. Unfortunately, the hotel was undergoing some refurbishment (and it needs it!). The breakfast room was therefore closed. Although the hotel staff did their best to accommodate this inconvenience, breakfast was very limited to say the least. Top floor, no elevator? Too small everything. Nice, friendly stuff. Not to far from.underground or bus. Nice neighbourhood. Breakfast ok, could be something more. Eggs maybe. The hotel was in really bad condition, there were working on the hotel and the noise was unreal. Also, it was really really expensive for the hotel conditions. I'll never back again. Poorly cleaned room, poor technical condition of the shower, repair in the hotel with extraneous sounds, breakfast at the reception, poor sound insulation. Extremely small bed (twin size used as double size), dirty carpets, horroristic lobby with an unbelievable dirty sofa.